How Important Is a Cover Reveal for Your Self-Published Novel? 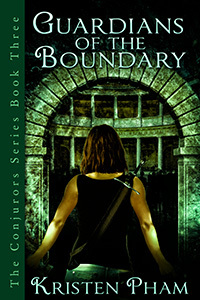 Later this month I will be publishing the third book in The Conjurors Series, Guardians of the Boundary. As part of my pre-launch activities, I considered doing a major cover reveal. I’ve seen self-published authors execute cover reveals with success, generating interest from their fan bases and even eliciting some pre-orders of their books. On the other hand, if you’re like me and have only so much time to devote to writing and marketing your books, it’s important to consider where you want to invest your time. As a result, I decided not to do a big cover reveal for Guardians of the Boundary (other than this article). Here are some questions you should ask yourself to determine whether it’s worth your time to have a cover reveal for your novel. Do you have a large existing fan base? If you do, then a cover reveal is a great way to keep your name and book top-of-mind for your readers. No matter how fast we write, there are bound to be gaps in time as we’re writing the next book, and a cover reveal can keep the buzz going around your name. But if you’re still developing your platform, like I am, there may not be many people who really care about your book, never mind your cover. It will take reviews, giveaways and word-of-mouth to generate interest in your book. Are you writing a series that has garnered a following? One of the reasons I seriously considered a cover reveal is because I’m writing a series, and I know my readers will be interested in hearing what’s coming next. It’s also a great way to reassure readers that your series hasn’t been dropped. In my case, however, my series and my personal brand as an author is still a fledgling, so I think I’ll put in the work required to execute a great cover reveal in after I’ve proven myself as an author who consistently puts out high-quality writing. Do you have existing relationships with bloggers who sponsor cover reveals? Many self-published authors have worked with bloggers to have their books reviewed or promoted. Some of those bloggers also publish cover reveals, as long as your cover art and blurb are high-quality. If you’ve been working with bloggers for other marketing activities, leveraging those contacts for a cover reveal may be a relatively quick way to generate interest in your book. Are you willing to pay to have your cover reveal publicized? There are some excellent companies that offer services to have your book reviewed or your cover reveal published on reputable blogging sites. If you are willing and able to pay a fee, your cover reveal doesn’t have to be a lot of work – someone else can line up the promotional activities for you. However, if your funds are limited, like mine, you might want to leverage this service after your book has been published, so readers can link to your book if it sounds interesting and check it out. However, if you are interested in the next book in The Conjurors Series, below is the blurb for Guardians of the Boundary, which will be published on Amazon at the end of the month. This entry was posted in Self Publishing and tagged cover reveal, guardians of the boundary, Kristen Pham, self-publishing, The Conjurors Series, writing by conjurors. Bookmark the permalink.